« The Blog of Forgotten Dreams? 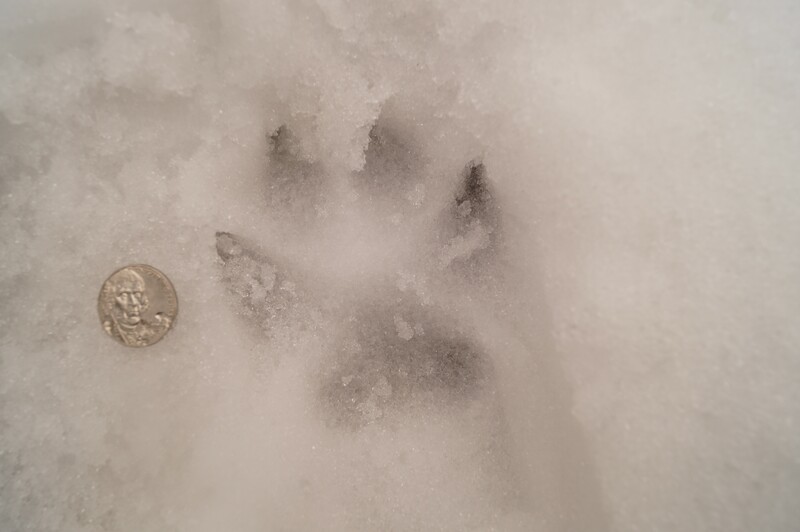 I came across some coyote tracks in the snow. One foot stepping where the other was. This is very common in coyotes. They walk almost without wasted movement. 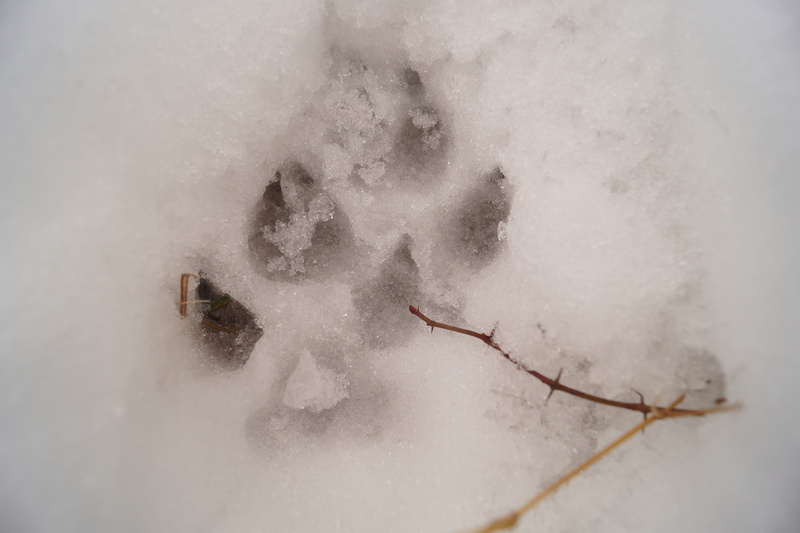 There is no hard and fast rule from telling dog tracks from coyote tracks, but in this case, there are no other domestic dogs running loose on this road. 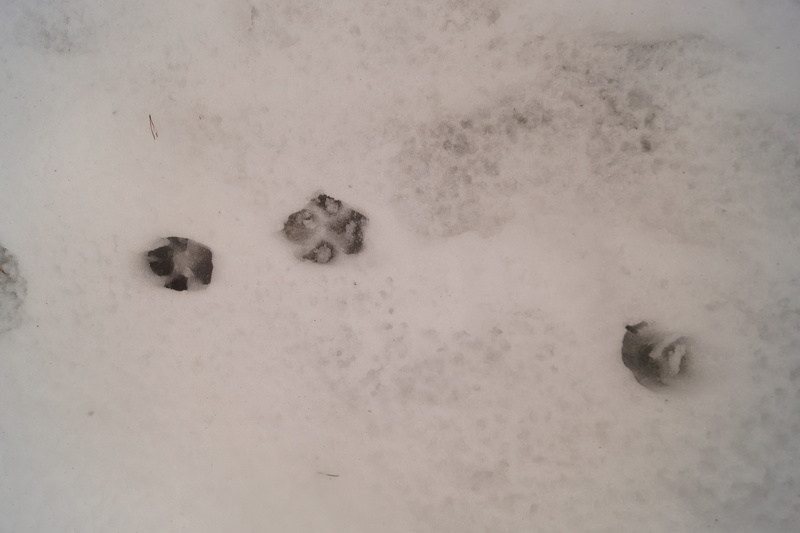 Golden retrievers have round “cat feet,” which gives them a pretty compact track in the mud or snow. Coyotes have pronounced center toes on their front feet. There aren’t many dogs that have that particular foot morphology, especially around here where sighthounds really don’t exist (except on the race track). Miley is also at least 1/3 larger than any coyote that lives here, and because her legs are proportionally shorter, she tends to dig in more when she runs. That’s how I tell them apart. on February 22, 2015 at 6:29 pm M.R.S. 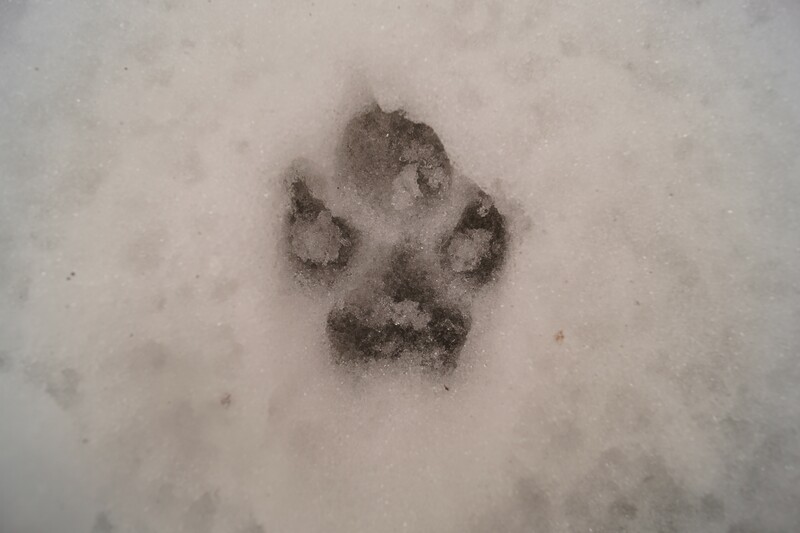 I’d guess that working collies’ tracks would be very like the coyotes’. With retrievers, it’s common for the front foot to be slightly larger and rounder than the hind foot. Maybe because they carry more weight on the front end, characteristic of a dog built for swimming., and a number of other breeds. Wolves and coyotes are very efficient in their gaits. Dog people could learn much from them. Of course many dog breeds are built for specialized purposes, hence will vary; but the wild canines are basic. 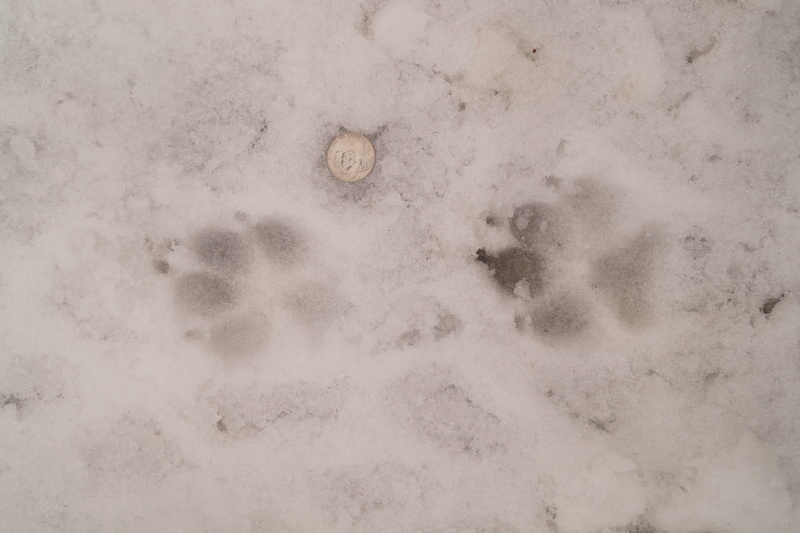 https://retrieverman.net/2012/07/07/close-encounters-of-the-coyote-kind/ Coyote pup tracks for comparison. 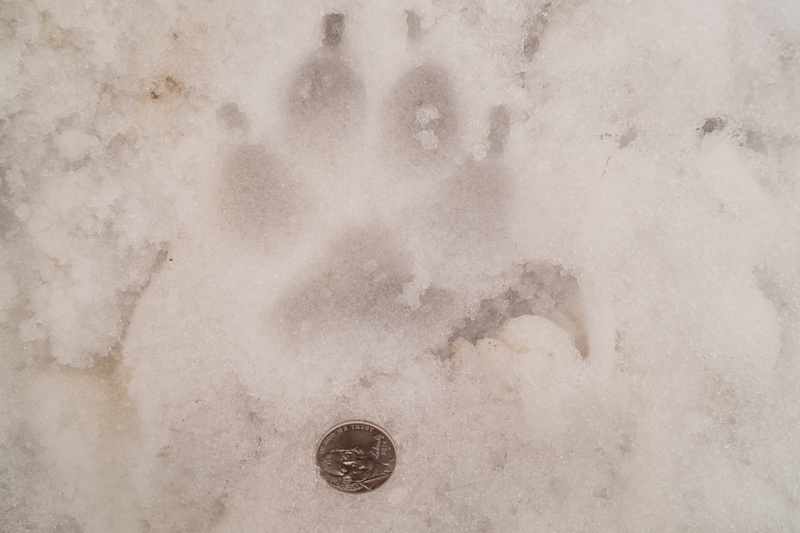 Wolf paw tracks have 3 pads, dogs have 5. There’s fossil evidence that this was true 26,000 years ago. How many pads do coyotes have on their paws? I discuss this in my forthcoming book, “Humans, Dogs, and Civilization.” soon to be available as an ebook and a print version. Um…what are you talking about? Wolves, dogs, & coyotes all have exactly the same number of pads. They also have the same number of pads as cats. And if you include the carpal pad, which does not contact the ground except when galloping or landing jumps, they all have 6. 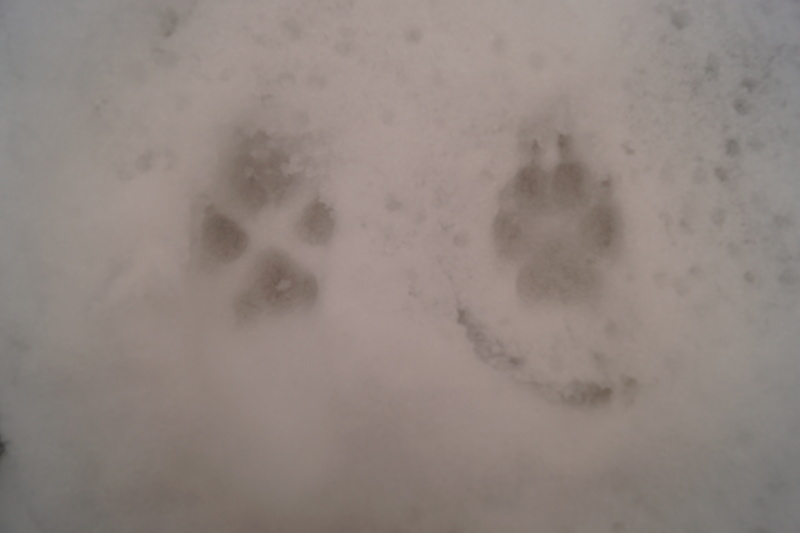 Footprints from walking or trotting animals will have 5 clear pad marks, the palmar pad & the 4 toes pads that contact the ground. Have you ever looked at a dog or a cat’s foot? The thing is we don’t know if that child and that canid were even contemporaries. 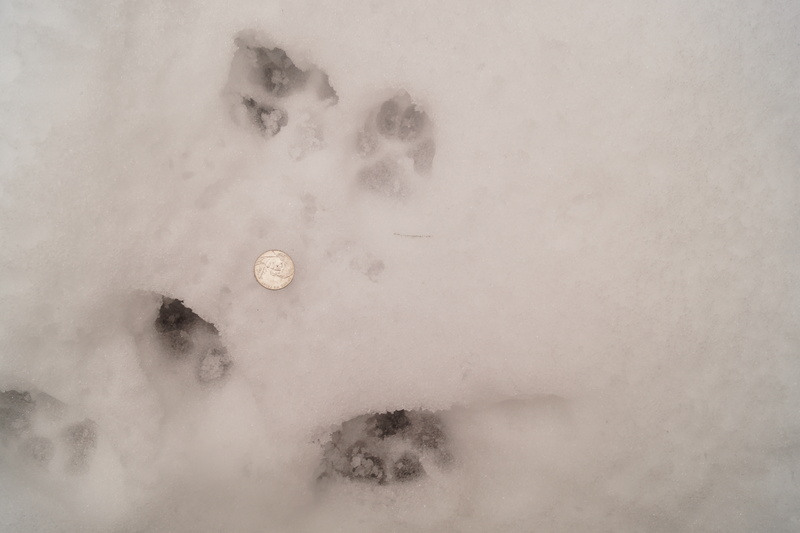 The dog-like signal isn’t the number of pads but the position of the toes, which is almost the same thing I pointed out here as the difference between dogs and coyotes. The best evidence for possible domestication from 26,000 or 27,000 years ago comes from the Czech Republic, where a dog or wolf was put to rest with with bone in its mouth. ame number of paw pads.